[New York] Let The Games Begin!! 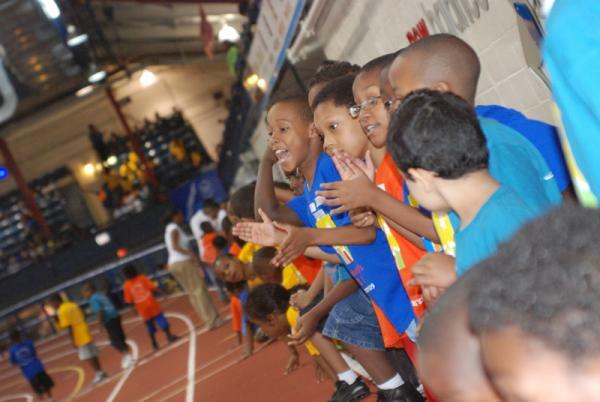 !, Today was a gorgeous and sunny day when the Harlem Children’s Zone hosted the Summer Games located at 216 Fort Washington Avenue and West 168th street, this event took place on Friday July the twenty sixth of twentieth thirteen. Some HCZ staff and students arrived on a school bus, while others walked; all of them went upstairs to the third floor to be seated as the HCZ Summer Games were about to start at 10:00am and ending at 4:00pm on the dot. Many of the main events were shown on a large projector screen including the fifty-five meter dash, the shot put, the two-hundred meter dash, the 4x200 meter relay, and the long jump. The 55 meter dash was for eleven - fifteen year olds who ran so fast at the New Balance Track and Field Center at The Armory; the crowd gave the runners a round of applause. The shot put contest was for the CSO site group and 19 year olds who Threw the heavy ball and had to spin themselves around in circles just to see how to throw it so far and so high. When The shot put athletes were finished it was on to the next event, which was the 200 meter dash for 13 - 15 year old students; and they were running so fast around the track which was splendid indeed. Next it was the long jump for the 11 - 14 and 16 - 18 year old students who ran and jumped as far as possible in the sand. The audience watched it all, and all the while many refreshments were served to each HCZ site, including Learn To Earn, Truce Media, Truce Fitness, Employment and Technology Center, College Success Office, A Cut Above and Promise Academy One. After all that, the HCZ students and staff from each site group stood for the national anthem, then on to the next event which was the 55 meter dash for the fastest staff member, both men and women.Each runner had to race at his or her own pace to see who could reach the finish line, Each and every last runner had a turn to compete. Finally comes the best events of the Games: the 11-12, 13-15, & 16-18 year olds competed in the 4x200 meter relay; four students from each site group ran in this event at his or her own pace, From what I saw, the students who won the 4x200 meter relay ran the fastest of all. Just to see who reached the finish line, the winners who earned the Bronze, Gold and Silver medal, were from A Cut Above, Truce Fitness and Promise Academy One.